We are honored to serve the Philippine National Police | Victory - Honor God. Make Disciples. 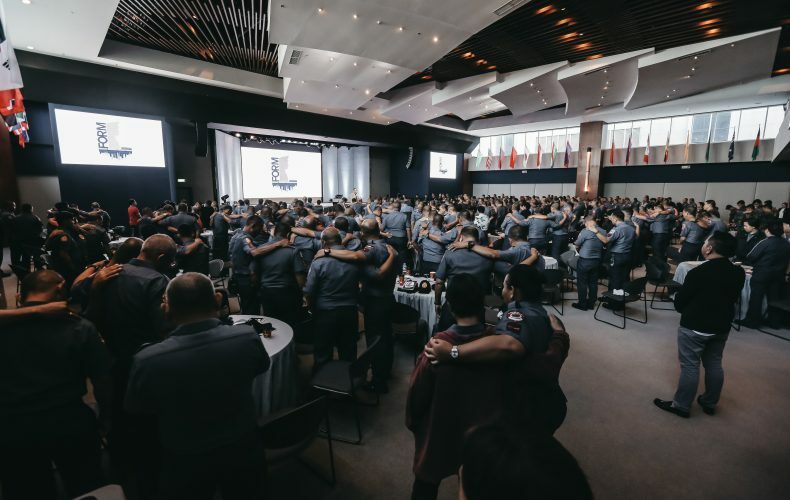 We at Victory are humbled to serve the nation and our men and women in uniform through a values formation program for members of the Philippine National Police, which concluded today, October 27, in a culmination ceremony at the Every Nation Building. For the past two weeks, it was our privilege to have served more than 1,000 police officers through a series of trainings on being godly (maka-Diyos), family-oriented (maka-pamilya), nationalistic (makabayan), and humane (maka-tao). Several pastors and Victory group leaders helped out with the whole-day trainings held in our locations in Ortigas, Greenhills, Pioneer, and Fort Bonifacio. The culmination ceremony started with a powerful time of worship as Victory Worship led everyone in singing Awit ng Bayan and declaring God’s promises over the Philippines. Police Director Romeo Purugganan, Director of Comptrollership of the PNP, delivered inspiring words of encouragement with his stories as a police officer. After Police Director Purugganan spoke, Bishop Ferdie Cabiling, Director of Victory in Metro Manila, preached about servant leadership and God’s purpose for government officials to be His appointed ministers in their areas of influence; both speakers’ messages aimed to renew the police force’s sense of calling and love for the nation. As a treat for our officers, recording artist Quest sang the song Saludo, which he wrote specifically for public servants such as the police. They also received special tokens of appreciation, kits that included Bibles and a special edition CD single of Awit ng Bayan. As the event came to a close, Police Superintendent Romy Palgue led the police officers in singing the PNP hymn and our pastors prayed a prayer of blessing for the police officers. We believe God is truly moving in the Philippines, especially in our government. We thank Pamilya Muna Pilipinas, Inc. for opening this opportunity for our church to be a blessing to the Philippine National Police. As we serve our nation through small and big ways, we are participating in God’s plan to bless every sector of society. Let us not give up in praying and believing for God’s promises to unfold in our nation. May we continue to honor God by helping more of our countrymen to know Him.